The very first of its kind in the region, the Avodah Kansas City Justice Fellowship is a six-month leadership development and community building program for young Jewish professionals and volunteer leaders working to address social and economic justice issues in Kansas and Missouri in both the Jewish community and the greater community at large. The Avodah Justice Fellowship has become a sought-after program for emerging Jewish leaders. It currently operates in New York City and Chicago and Avodah is thrilled to now make this program available to early and mid-career professionals in Kansas City. Gain on-the-ground experience in social justice work within a supportive, pluralistic Jewish community. Nearly one-fifth of all Kansas City residents live below the poverty level. 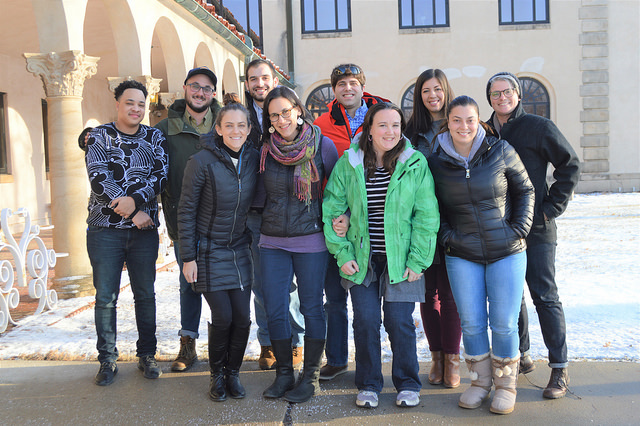 The urgency of these needs and the desire for the young Jewish community to meaningfully live out the Jewish values of tzedek, justice, make the Avodah Kansas City Justice Fellowship a much-needed and highly desired undertaking. Through the Avodah Kansas City Justice Fellowship, young Jewish leaders will be equipped with skills critical to their identity and growth in order to help create a community that incentivizes young Jews to stay in Kansas City long-term, take on prominent Jewish leadership roles, become more connected to the Jewish community, and positively impact the community’s future. Meet Avodah’s Kansas City Justice Fellowship Director and Avodah alumna, Amy Ravis Furey. Click here to apply for the Avodah Justice Fellowship in Kansas City.